Most weddings include a Unity Ceremony to symbolically represent the union of two people. Traditionally, using two separate small candles to light a larger one is acceptable in most religious ceremonies. Some couples choose to honor their Christian beliefs by having a God's Knot Tying ceremony. This includes the tying or braiding together of three cords: a white one to represent the bride, gold for the groom, and purple to symbolize God. The Bible verses from Ecclesiastes 4: 9-10, and 12 can be read aloud at this time. In some ceremonies honoring Jewish beliefs, the bride circles the groom and the groom does the same. In some Greek Orthodox ceremonies, the officiant puts a crown which can be made out of various materials on the heads of the bride and groom. If your wedding will be a religious one, you may have to follow a prescribed list of what's allowed and what isn't. Many couples look to their families' cultural heritages for ideas for the Unity Ceremony. In one American Indian tradition, the bride and groom are wrapped together in one blanket as a sign of the comfort and love they'll bring to each other. A purification ritual using sage called smudging is part of some indigenous cultures and has found its way into many weddings. Sage is an herb believed to have cleansing properties that purge negative energy. The officiant uses a smoldering bundle of sage to perform this ritual. The "jumping the broom" ritual originated in the early 1800s, when enslaved African Americans weren't allowed to get married in a formal ceremony. The tradition that developed was to lay a broom on the ground and jump over it together, to unite the couple. Today, the act represents a "brushing away" of the past in order to start clean. Some couples put soil around a small tree or plant as a symbol of unity and growth and later bring it into their homes or transplant it in their yard. My favorite variation of this option was when a couple took dirt from both their childhood homes as well as dirt from their new home together and used that to plant the tree in the pot they had. Other couples join various cut flowers or evergreen branches into a common vase and often include family members in this building of a bouquet. Blending wine, beer, or cocktails into a single vessel can be done for a Unity Ceremony. Likewise, couples have broken bread together and one couple even shared a sandwich they made as their symbol of unity. 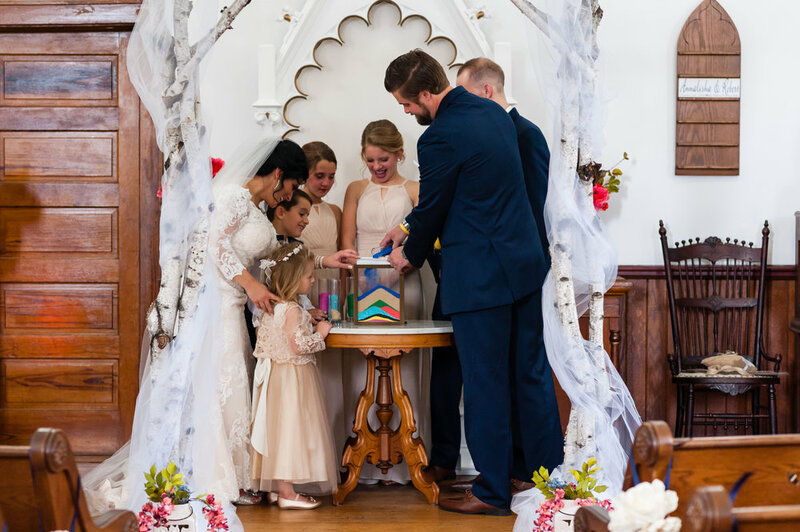 Joining different colored substances such as sand, glass crystals, or salt is a possible idea for your Unity Ceremony. A recent trend is the creation of a piece of artwork during this part of the wedding. Art work has included drawings, paintings, putting together pieces of a wood puzzle with family pictures etched on it, and even the welding together of two large pieces of metal by the bride and groom who were both pipefitters! Another interesting choice was the making of one of those old science project volcanoes that had food dye added to the vinegar poured into baking soda so the erupting lava turned a new color. No matter what elements you choose to include in your Unity Ceremony, this is a chance for you and your partner to put a stamp of uniqueness into your wedding. Are you two planning on having a Unity Ceremony? What do you have in mind so far?